A sagittal section of a kidney shows that many branches of the renal artery and renal vein reach inside a kidney (Fig. 16.3a). Removing the blood vessels shows that a kidney has three regions (Fig. 16.3b). The renal cortex is an outer, granulated layer that dips down in between a radially striated inner layer called the renal medulla. The renal medulla consists of coneshaped tissue masses called renal pyramids. The renal pelvis is a central space, or cavity, that is continuous with the ureter. Under higher magnification, the kidney is composed of over one million nephrons, sometimes called renal or kidney tubules (Fig. 16.3c). 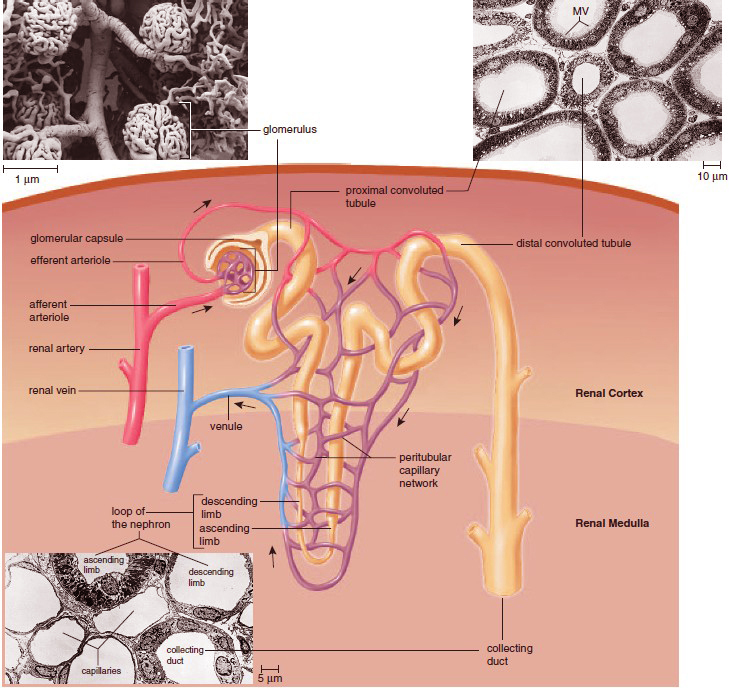 Each nephron has its own blood supply, including two capillary regions (Fig. 16.4). From the renal artery, an afferent arteriole leads to the glomerulus, a knot of capillaries inside the glomerular capsule. Blood leaving the glomerulus enters the efferent arteriole. The efferent arteriole takes blood to the peritubular capillary network, which surrounds the rest of the nephron. From there, the blood goes into a venule that joins the renal vein. Each nephron is made up of several parts. First, the closed end of the nephron is pushed in on itself to form a cuplike structure called the glomerular capsule (Bowman’s capsule). The inner layer of the glomerular capsule is composed of podocytes that have long, cytoplasmic extensions. The podocytes cling to the capillary walls of the glomerulus and leave pores that allow easy passage of small molecules from the glomerulus to the inside of the glomerular capsule. Next, there is a proximal convoluted tubule (PCT), called “proximal” because it is near the glomerular capsule. The cuboidal epithelial cells lining this part of the nephron have numerous microvilli about 1 mm in length. These microvilli are tightly packed and form a brush border, increasing the surface area for reabsorption. 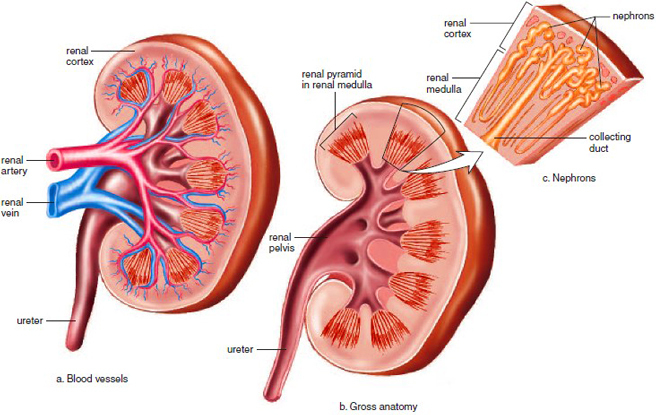 Figure 16.3 Gross anatomy of the kidney. a. A sagittal section of the kidney showing the blood supply. Note that the renal artery divides into smaller arteries, and these divide into arterioles. Venules join to form small veins, which join to form the renal vein. b. The same section without the blood supply. Now it is easier to distinguish the renal cortex, the renal medulla, and the renal pelvis, which connects with the ureter. The renal medulla consists of the renal pyramids. c. An enlargement showing the placement of nephrons. (loop of Henle). Each loop consists of a descending limb and an ascending limb. The cuboidal epithelial cells of the distal convoluted tubule (DCT) have numerous mitochondria, but they lack microvilli. This is consistent with the active role they play in moving molecules from the blood into the tubule, a process called tubular secretion. The distal convoluted tubules of several nephrons enter one collecting duct. Many collecting ducts carry urine to the renal pelvis. As shown in Figure 16.4, the glomerular capsule and the convoluted tubules always lie within the renal cortex. The loop of the nephron dips down into the renal medulla; a few nephrons have a very long loop of the nephron, which penetrates deep into the renal medulla. Collecting ducts are also located in the renal medulla, and they give the renal pyramids their lined appearance. Figure 16.4 Nephron anatomy. A nephron ismade up of a glomerular capsule, the proximal convoluted tubule, the loop of the nephron, the distal convoluted tubule, and the collecting duct. The photomicrographs show these structures in cross section; MVmicrovilli. You can trace the path of blood about the nephron by following the arrows.